Off to another of the big anchorages in the Broken Group, this one on Nettle Island. I poked into a several other anchorages, all of which were either occupied or too exposed to be comfortable. 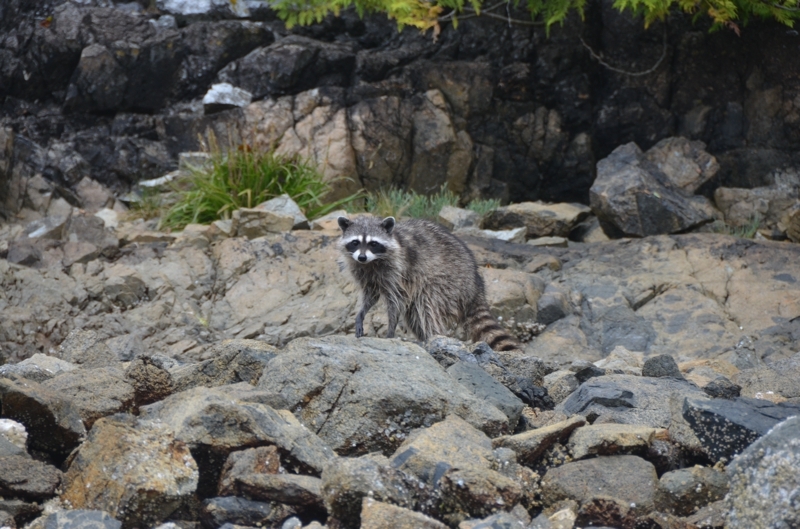 This raccoon is the full extent of the mammals I've seen in Barkley Sound so far (besides humans, of course). Surprisingly, I was the first to arrive at the Nettle Island anchorage today. But several more boats came in soon afterwards. Eventually four other boats anchored nearby…certainly better than Joe’s Bay. Again, good kayaking around Nettle Island. Seemingly endless rocky outcroppings and islets await exploration. The weather has been cloudy most of the time since I’ve been in Barkley Sound. The sun broke out yesterday afternoon. Most mornings are foggy, with either very heavy dew or very light rain.